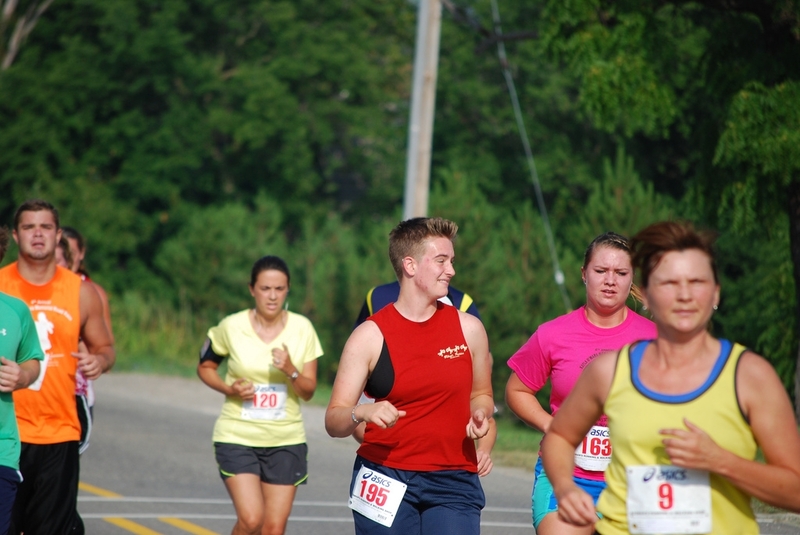 In July, I hesitantly entered a 5K race in Batavia to benefit Suicide Prevention Services. My daughter Mel’s boyfriend was co-founder of the event, and our entire family entered. Mel assured me I could walk. I have been walking short distances every day and had just added a little running, so I planned to walk most of the race and run when I could. I lined up with the runners, staying near the back so I wouldn’t block anyone. The starting gun fired, and off we went. The route went through a park and along the Fox River. Volunteers showed us where to go at every crossroad. Quotes were written in chalk along the asphalt path: “Life is worth fighting for.” “Hope is real and change is possible.” “Stay strong because you’re worth it.” “Don’t Give Up.” I was uplifted and thought the sayings are good advice not only for the race, but for my life. Mel and her friend Morgan had decided to walk, so I passed them early on. I shouted, “I can’t believe I passed you, Mel!” Mel was on the track team in high school and is very fast when she wants to be. Before long, the two of them zipped past me. As I ran, I passed a woman. Then I walked, and she passed me. When she slowed, I moved ahead. Meanwhile, I passed Mel and Morgan again—they had gone back to walking. They decided to run the rest of the race and passed me easily. I invited the woman who I was “neck and neck” with to run together. Jackie told me the race was in memory of a young man she knew who had taken his own life in high school. That put a new perspective on what we were doing by being in the race and what was important. Jackie and I motivated each other to run as much as we could, and we crossed the finish line together. My race time was 43 minutes, 29 seconds. I hadn’t burned up any pavement, but I felt good. After the race, my son Jim came up to me and said, “Mom, you placed third in your age group!” Jim and my husband Ken also placed third in their age groups, and my daughter Katie placed fourth. Granted, my age group had only six participants. Nonetheless, when my name was announced, I was proud to go up to the stage and collect my 3rd Place ribbon. Do you have a favorite inspirational quote? Have you had an uplifting experience recently? Please respond in the comments below. This entry was posted in Inspiration, Motivation, Running, Women and tagged Inspiration, Motivation, running, Women. Bookmark the permalink. Kathy, Thank you for your kind words! I love that Bible verse that you mentioned, “I can do all things through Christ who strengthens me.” Great to hear from you. We enter the race, not just for the place, we do our best because it is God putting us to the test. Very inspirational. Thanks for sharing. Sharla, I like your cute poem in the comments above. Thank you so much for the nomination for the One Lovely Blog Award. I’m honored and humbled. I enjoy your writings as well and encourage everyone to check out Sharla’s blog at http://catnipoflife.wordpress.com/. I’m enjoying your blog, Sue. It’s inspirational to me to read about “making strides” again since my life has unfortunately become so sedentary. I’ll look forward to more posts! So inspirational!! Thank you for sharing over on our Courage-fest over at Bliss Habits! For my readers: Kathy has an inspiring blog encouraging us to cultivate habits to give us bliss moments. The post above was added to their post on the topic of Courage. You can see their full post, which references several blog articles about conquering fear, at http://blisshabits.com/2014/02/speaking-of-courage-how-do-you-get-past-fear/ .